At this year’s Shelby County History Awards Dinner the Shelby County Historical Commission awarded the Ed Williams Teacher of the Year Award. Mr. Williams served as historian for Shelby County, trustee for Bolton College, trustee for Faith Christian Academy and a member of Nathan Bedford Forrest Camp 215 Sons of Confederate Veterans, Tennessee Historical Society, West Tennessee Historical Society, and Davies Manor Association Board until his death in 2013. 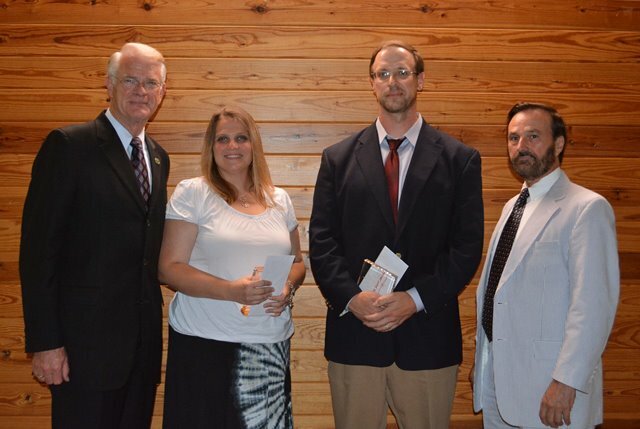 To honor Mr. Williams an award was established for Shelby County teachers to recognizes an exemplary teacher who inspires students to have a love for history through innovative teaching methods and creative approaches. This competition is open to all public, private and home school teachers. The recipients were 2013 winner, Dr. Scott Johnson, Lausanne Collegiate School and 2014 winner Sherrie Hopper, First Assembly Christian School. Dr. Johnson is the Director of the Chapman Woodbury Oral History Program at Lausanne Collegiate School Upper School. This year he was honored at the national level for his efforts involving National History Day and was named as one of two winners in Tennessee to receive the Patricia Behring Teacher of the Year Award for his or her state and was recognized at the University of Maryland at National History Day. Sherrie Hopper joined the FACS staff in 2008 and teaches high school world history, advanced placement government, and dual enrollment government. She holds a Bachelor of Arts degree in Political Science with a minor in criminal justice and a Master of Arts in Political Science with an emphasis in international law and public policy from the University of Memphis. She is a licensed instructor in history and government and is currently working toward her Ph.D. in history.